Holby City has announced the addition of three new regular characters who will debut in May 2012. The BBC One show will first introduce the "charmingly candid and utterly professional" consultant general surgeon Serena Campbell, played by Catherine Russell (The Inspector Lynley Mysteries, Pete versus Life). Next to join the drama is "cocky and roguish" nurse and transplant coordinator Jonny Maconie (Michael Thomson), who "has no qualms about telling a few white lies to stir up some mischief". Lastly, Dead Set and Campus star Chizzy Akudolu joins the cast as Jonny's "generous, plain-speaking and warm-hearted" best friend Mo Effanga, who joins Holby as registrar cardiothoracic surgery. Holby City executive producer Johnathan Young said: "These are three very talented actors and I am delighted to welcome them to the cast. "There are some dramatic and exciting storylines coming up on Holby City over the next few months and I know our new additions will have an immediate impact." Holby City continues on BBC One and BBC One HD every Tuesday at 8pm. Does this mean some of the current cast will leave to make way for these new actors, I wonder?? Sahira, Greg and Frieda will all be leaving in the spring. Holby City airs a big episode for Serena Campbell next week as her relationship with her mother Adrienne comes under close scrutiny at work. Adrienne, who is suffering from vascular dementia, is admitted to the hospital by Serena following a series of mini-strokes. Digital Spy recently caught up with Catherine Russell, who plays Serena, to hear more about next week's episodes and her thoughts on the ongoing dementia storyline. How have you felt about exploring this storyline? "It's always delightful to get a good meaty storyline, particularly when it involves someone who your character is closely connected to. That brings in a whole new dimension that you don't often get on Holby, because usually our characters are dealing with patients who they don't know. When it's a family member, it obviously adds another element to it which makes it more poignant. "In this case we're dealing with Serena's mother who has dementia rather than a patient who does, so that brings a completely different light to it. Doctors aren't really supposed to treat their own friends and families, but Serena always seems to try and ignore that rule when it comes to herself! That then adds tensions between herself and her fellow colleagues, so it's a fantastic melting pot of high emotion and medicine at the same time." Have you had much feedback for the story from the viewers? "Yes, I have actually because I'm a fan of Twitter, which surprises myself because I can barely turn a television on, let alone deal with that sort of thing! I have had a lot of response on Twitter from people who are really pleased that we're doing this story, because as our population gets older, this is something that is affecting more and more people. "Rather like any major health issue, it doesn't just affect that person but the entire family too. It can be a very stressful, difficult and depressing condition to deal with, so I've heard from a lot of people who are very grateful to be able to have their story highlighted. "It's been 100% positive feedback so far from people saying that we're getting it right, which is wonderful. It has been very well-researched and the BBC have worked in conjunction with the Alzheimer's Society on it. I think we've all treated it with the sensitivity that it deserves." Have you had to do any personal research too? "I choose to - nobody is standing over us with a stick! To be perfectly honest, it's the beauty of that Google machine. I can run to it and look up any number of articles that I can choose to read. It's been a fantastic source. "The actress who plays my mother, Sandra Voe, has also been very helpful. Because she has to play the person who has dementia, she went into dementia wards herself to meet people and make sure that she was getting it right. So between me, Sandra, the Google machine, the producers and writers, we've all come to the same point. At the same time, it is a confusing disease because there are so many different elements to it and so many people react to it in different ways." Was next week's episode one you particularly enjoyed sinking your teeth into? "It was, yes. To be honest, whenever Sandra appears in a script, I'm clapping my hands with delight because she is so brilliant. I would cross hot coals to play anything with Sandra in, because I know it's going to be a fabulous working environment and I'm very fond of her. "The episode is a bit depressing and I would be lying if I said it wasn't. It obviously has the ugly side of dementia and the really tragic side of it. That's not to say there isn't some lightness in the episode because there is, of course there is. Thank goodness we have three stories in each episode so you can go to another ward for a bit of lightness! 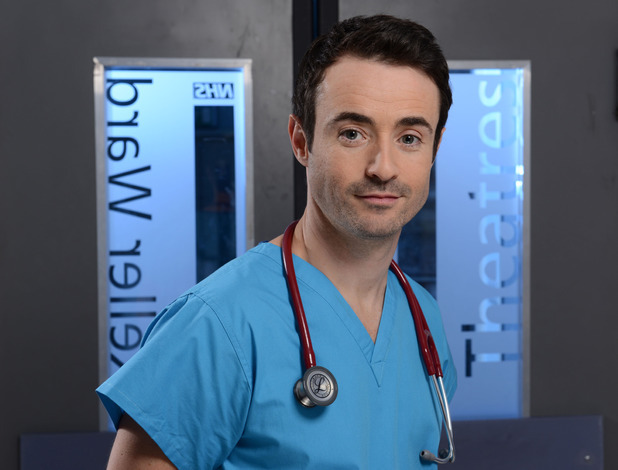 It's also very lovely to be working with Joe McFadden and Alex Walkinshaw, because they're very involved in this particular storyline as well." Does filming the emotional scenes ever take its toll? "Usually I'm not the sort of actor who takes work home with me. If I'm playing somebody very miserable, I don't come home feeling like that on the whole. However, this storyline has had a longevity to it - which is right so we can see the progression of the illness - but it did wear me out a bit, to be honest. It was quite gruelling, but I hope some good work has come out of that." What can you tell us about the allegations that Adrienne makes against Serena? "Fletch and Raf discover some bruising on Adrienne. Adrienne seems to accuse Serena of various aggressive behaviours and of stealing her rings - she's very upset about that. Fletch and Raf then have the very uncomfortable and difficult position - given that Serena is their superior - of confronting her with that. The story then unfolds from there." Does Serena find it difficult when her professional and personal lives collide in a situation like this? "Yes, I think most of the time she does find it difficult, however I think that it must be a certain amount of comfort to know that she can at least influence her mother's care and have Adrienne under her beady eye as she does. She really is determined not to let Adrienne out of her sight! "Even though that's against hospital protocol, at least Serena can hand over Adrienne's care to Raf - a colleague who she knows, trusts and likes. In a sense it's a double-edged sword for her. On the one hand, of course you don't want to have your family members coming into the hospital, but if nothing else, at least she can control Adrienne's care. We all know that, if nothing else, Serena Campbell is a controller! She likes to be in control so at least this gives her that." What else is coming up for Serena? "The majority of what's coming up is to do with the progression of her mother's dementia and how she does, or does not, cope with that. "There's also a real genuine, burgeoning friendship and warmth between Serena and Raf. There's some real fun to be had there and some typically drunken evenings! As we know, Serena does like a tipple so I can let our loyal viewers know there's a few more treats in store in terms of her sobriety!" After more than two years on the show, are you happy to stay around for a while longer? "I think so! It's up to the producers as to whether they ask me in the first place, but Holby is a bit of a strange TARDIS of a show in terms of time. You walk into the door and suddenly two years has gone by! I've been in theatre shows that have lasted for six months and they've felt like six years, but this is the other way around. "Time flies by and I think it's because every day is different. We're constantly working with different actors because of the patients who come into the hospital, and the casting department are sensational, so we're always working with really top-quality actors. That's such a treat which keeps us on our toes. "I'm also lucky with Serena, because she is such a multi-dimensional character and she can go anywhere. She's got the comedy element to her, she's got the fun side to her, the controlling side and the seriousness too. It's never dull. Luckily I never pick up a script and think, 'Oh I'm doing that again?' Holby's team write really fun interesting stuff for me, as well as the serious heavyweight drama which also has its own fascination and challenges. I don't see any reason to go anywhere!" Holby City star Michael Thomson has spoken about his exit from the show for the first time, explaining that he is excited to be returning to theatre. The actor's character Jonny Maconie bowed out from the BBC One medical drama in last night's episode, which saw him finally get a happy ending with his on-off love interest Jac Naylor and their daughter Emma. 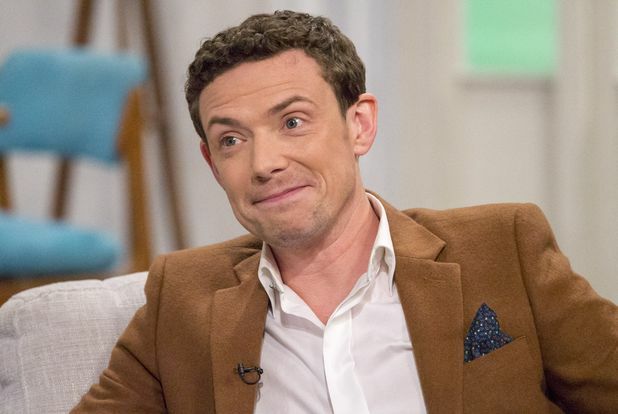 Thomson appeared on ITV's Lorraine this morning (April 8) and reflected on his three-year stint at Holby, admitting that he never thought he would get so many dramatic storylines. He laughed: "I spent the first six months expecting to get sacked, so I didn't expect it! I'd never done any telly and I was singularly terrified of the entire thing. The first six months was just me containing terror, so if you look back, it's hilarious. "I didn't expect it, but little by little they trusted me, the fans started to take to him and the stories got more and more intense and compelling. I've just been spoiled." Discussing the end of the Jac and Jonny storyline, Thomson said: "They've been circling each other for such a long time and they've sort of torn each other apart. Now they've got to a point where they've worked out what they mean to each other. "They're on the early stages of starting to be a proper family. It's lovely, because I think the fans have wanted that for a long time. They really wanted Jac to get a happy ending." Thomson's next job will see him return to his stage roots for the National Theatre of Scotland, starring in The Driver's Seat. The play will be performed in June at the Lyceum Edinburgh and in July at The Tramway Glasgow. He said today: "Holby was my first proper television role. It'd all been theatre up until then and that's my natural environment, so I'm really looking forward to returning to theatre now that I've come out of Holby. I'm terrified but really looking forward to getting back to it. "It's a complete flip of skills - it took me a long time to refine how to talk on camera without thinking about filling a big 500-seater theatre! To go back to that, your voice support and all of that other technique that you were so comfortable with and came so naturally, you have to rediscover. It's terrifying but I couldn't be more excited." It's one shock after another for Holby City favourite Mo Effanga next week when she comes face to face with Mr T again, but later makes an unwelcome discovery. Mo (Chizzy Akudolu) will be delighted when she finds out Mr T is back working at the hospital next week - having left for Sweden earlier this year. The first shock for Mo comes when her obstetrics consult request for Betty leads to Mr T arriving on the ward. Mo hasn't seen him since he left for the airport after their one-night stand, and she's keen to make amends. Sadly, the second shock she receives means that she may have missed her chance. Mo is gutted when Mr T makes it clear he'll work with her professionally but that's it. And her third shock leaves her (almost!) speechless when Mr T introduces his fiancé - fellow nurse, Inga. Of course, viewers know that Mo is secretly carrying Mr T's baby, but will she finally tell him the truth? Or will this latest twist force her to keep quiet for good? Holby City airs these scenes next Tuesday (September 6) at 8pm on BBC One. Holby City fans don't have long to wait until Serena Campbell's return, as Catherine Russell is back at work this week. The actress took a break from the show earlier this year, but is due to return to filming next week – meaning Serena's comeback is getting closer. Catherine excited her Twitter followers today (October 12) by revealing that she was on her way to the studios for a costume fitting – ahead of her official return on Monday. "About to get a @TLRailUK train for the 1st time in 9 months to @ElstreeStudios It's due at 8.53 from #Streatham. Watch this space folks," she said, before later adding: "1st day filming on Monday. Today is all about costume!" About to get a @TLRailUK train for the 1st time in 9 months to @ElstreeStudios It's due at 8.53 from #Streatham. Watch this space folks. 1st day filming on Monday. Today is all about costume! Serena made a temporary departure from the show at the start of the year, in order to appear in the comedy play What the Butler Saw. Although Serena's return wasn't officially confirmed back then, it was always clear that she wouldn't be gone for that long – with show boss Kate Hall promising that her popular love story with Bernie Wolfe wasn't over. Kate said to Digital Spy: "As I was story producer previously, Bernie and Serena is my storyline and I'm highly invested in that. It's a very personal storyline for me, because it's loosely based on a friend of mine. I was maid of honour at her wedding to her partner, when they were finally able to get married in the UK. So the story is a celebration, really. "Telly is incredibly hard to work in, as the shoot hours can be very long, so sometimes cast members will ask for a break. The only reason there is a hiatus in that storyline is for this reason. If we can make it work, we always try to say yes, because it's a great way of keeping your talent." She added: "Catherine Russell is having beautiful travels in Europe and having a smashing time, while Jemma Redgrave also wanted a break. I can promise there's no way I'd work so hard to create something I believe in so fundamentally and then just kick it into the gutter. "I'm overwhelmed and really gratified by the reaction that story has received, because I'm very proud of it. Of course we will return to it as and when the actors feel ready to return, but suffice to say, that's a love story that remains."